It may occur at any age, females are more affected. 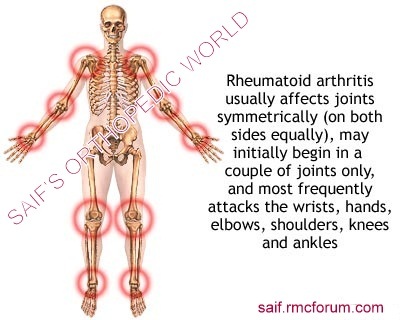 In rheumatoid arthritis, multiple joints are usually, but not always, affected in a symmetrical pattern. 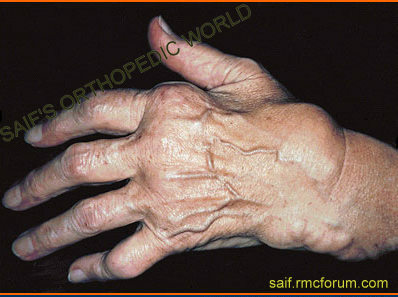 A chronic case of rheumatoid arthritis can cause permanent joint destruction and deformity. Damage to joints can occur early and does not correlate with the severity of symptoms. The rheumatoid factor (RF) is an antibody that can be found in the blood of 80% of rheumatoid arthritis patients. There is no known permanent cure for rheumatoid arthritis. Early treatment of rheumatoid arthritis results in better outcomes. Rheumatoid arthritis (RA) is an autoimmune disease that causes chronic inflammation of the joints. It also may affect structures around the joint like tendons ligaments, muscles and other soft tissues. Autoimmune diseases are the diseases where own body’s tissues are mistakenly attacked by their own immune system. As rheumatoid arthritis can affect multiple other organs of the body, rheumatoid arthritis is referred to as a systemic illness and is sometimes called rheumatoid disease. The causes of rheumatoid arthritis are unknown. There are two hypotheses about the cause of rheumatoid arthritis. The hypothesis of autoimmunity, possibly t type 2 collagen is based on the observation that the serum of many patients (80%) with rheumatoid arthritis contains an antibody known as rheumatoid factor (RF), which reacts with the body protein gamma globulin. Immune cells, called lymphocytes, are activated and chemical messengers (cytokines, such as TNF, interleukin-1/IL-1, and interleukin-6/IL-6) are also responsible for it. Hypothesis of infection is likewise without foundation. Infection- possibly by virus or mycoplasma may cause liberation of antigenic type 2 collagen from patient’s own articular cartilage and then rheumatoid arthritis arises. The main symptom of rheumatoid arthritis is pain at the joints. 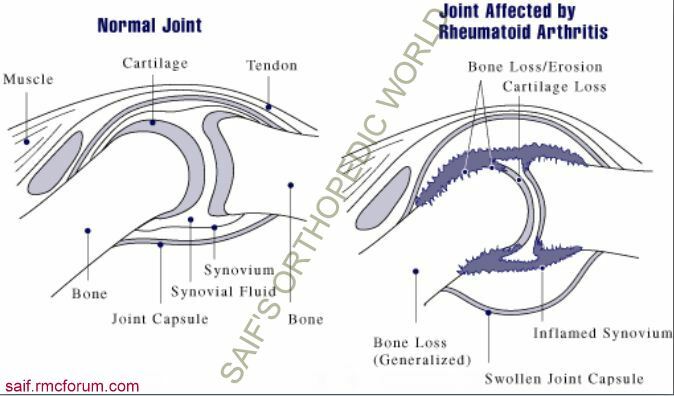 Any joint may be involved but small joints are more susceptible of rheumatoid arthritis. It usually occurs at wrist, feet, knees, elbows and seldom at spine, hip and shoulder. Onset of pain is gradual, swelling of joint occurs gradually as well due to synovial thickening and more joint fluid. Soon a number of joints are similarly affected. Pain and stiffness are often worst when activity is resumed after resting and at morning. Pain usually lasts for an hour. Pain is symmetrical and involves multiple joints. The skin over the joint become warmer. Occasionally, only one joint is inflamed. When only one joint is involved, the arthritis can mimic the joint inflammation caused by other forms of arthritis, such as gout or joint infection. Chronic inflammation can cause damage to body tissues, including cartilage and bone. This leads to a loss of cartilage and erosion and weakness of the bones as well as the muscles, resulting in joint deformity, destruction, and loss of function. The symptoms of rheumatoid arthritis come and go, it depends on the degree of tissue inflammation. If body tissues are inflamed, the disease is active. When tissue inflammation subsides, the disease becomes inactive (in remission). Remissions can occur either spontaneously or with treatment and can last weeks, months, or years. During remissions, symptoms of the disease disappear. When the disease becomes active again (relapse), symptoms return again. The return of disease and symptoms is called a flare. Fatigue, loss of energy, anorexia, low-grade fever, muscle and joint aches, and stiffness are the common complaints when the disease is active. Dryness of eye can lead to corneal abrasion. There is no singular test for diagnosing rheumatoid arthritis. 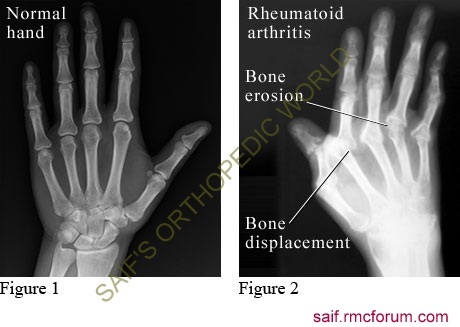 Instead, rheumatoid arthritis is diagnosed based on a combination of clinical presentations and laboratory findings of blood rheumatoid factor and critulline antibody, antinuclear antibody (ANA) as well as findings of rheumatoid nodules and radiographic changes (X-ray testing), ESR, C-reactive protein. Abnormal antibodies can be found in the blood of people with rheumatoid arthritis. An antibody called “rheumatoid factor” (RF) can be found in 80% of patients with rheumatoid arthritis. Patients who are felt to have rheumatoid arthritis and do not have positive rheumatoid factor testing are referred as having “seronegative rheumatoid arthritis.” Citrulline antibody is useful in the diagnosis of rheumatoid arthritis in case of unexplained joint inflammation. The rheumatoid factor, ANA, ESR and C-reactive protein tests can also be abnormal in other systemic autoimmune and inflammatory conditions. Therefore, abnormalities in these blood tests alone are not sufficient for a firm diagnosis of rheumatoid arthritis. The American College of Rheumatology has developed a system for classifying rheumatoid arthritis that is primarily based upon the X-ray appearance of the joints. This system helps medical professionals classify the severity of your rheumatoid arthritis with respect to cartilage, ligaments, and bone. There is no known cure for rheumatoid arthritis. To date, the goal of treatment in rheumatoid arthritis is to reduce joint inflammation and pain, maximize joint function, and prevent joint destruction and deformity. NSAIDs are the first line treatment for rheumatoid arthritis. Aspirin, naproxen, ibuprofen, etodolac are the examples of NSAIDs which are commonly used in rheumatoid arthritis. Patients’ responses to different NSAID medications vary. The most common side effects of aspirin and other NSAIDs include stomach upset, abdominal pain, ulcers, and even gastrointestinal bleeding. In order to reduce gastrointestinal side effects, NSAIDs are usually taken with food. PPI, H2 blockers, sucralfate etc are also given along with NSAIDs. Newer NSAIDs include selective Cox-2 inhibitors, such as celecoxib (Celebrex), which offer anti-inflammatory effects with less risk of stomach irritation and bleeding risk. 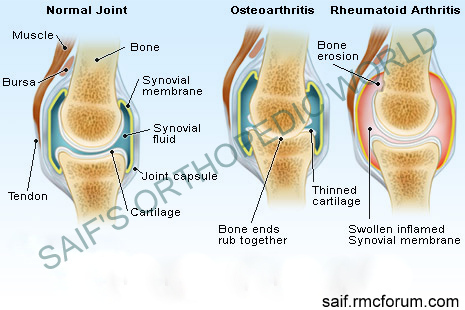 Oral and intra-synovial injection of Corticosteroid is also effective treatment for rheumatoid arthritis. Second line treatment of rheumatoid arthritis includes disease modifying anti rheumatoid drug (DMARD). These are methotrexate, hdroxychloroquine, sulfasalazine, gold salt, D-penicillamine etc. Recent research suggests that patients who respond to a DMARD with control of the rheumatoid disease may actually decrease the known risk of lymphoma. Hydroxychloroquine (Plaquenil) is used over long periods for the treatment of rheumatoid arthritis. Possible side effects include upset stomach, skin rashes, muscle weakness, and vision changes. Sulfasalazine has fewer side effects. Methotrexate has gained popularity among doctors because its effectiveness against rheumatoid arthritis is good and relatively infrequent side effects. It also has an advantage in dose flexibility (dosages can be adjusted according to itis need). Methotrexate is an immunosuppressive drug. It may cause hair fall. It can affect the bone marrow and the liver; all people taking methotrexate require regular blood tests to monitor blood counts and liver function. Gold salts have been used to treat rheumatoid arthritis for a long ago. Gold thioglucose (Solganal), gold thiomalate (Myochrysine) are given by injection, initially on a weekly basis, for months to years. Side effects of gold (oral and injectable) include skin rash, mouth sores, kidney damage with leakage of protein in the urine, and bone marrow damage with anemia and leukopenia. Those receiving gold treatment are regularly monitored with blood and urine tests. Oral gold can cause diarrhea. These gold drugs have lost favor because of the availability of more effective treatments. D-penicillamine (Depen, Cuprimine) can be helpful in selected cases of progressive forms of rheumatoid arthritis. Side effects are similar to those of. People taking this medication require routine blood and urine tests. D-penicillamine can rarely cause symptoms of other autoimmune diseases and is no longer commonly used for the treatment of rheumatoid arthritis. Immunosuppressive medicines are powerful medications for rheumatoid arthritis that suppress the body’s immune system. A number of immunosuppressive drugs are used to treat rheumatoid arthritis. They include methotrexate as described above, azathioprine (Imuran), cyclophosphamide (Cytoxan) etc. Because of potentially serious side effects, immunosuppressive medicines (other than methotrexate) are generally reserved for those who have very aggressive disease or those with serious complications of rheumatoid inflammation, such as blood vessel inflammation (vasculitis). The exception is methotrexate, which is not frequently associated with serious side effects and can be carefully monitored with blood testing. Methotrexate has become a preferred second-line medication as a result. Newer “second-line” drugs for the treatment of rheumatoid arthritis include leflunomide (Arava) and the “biologic” medications etanercept (Enbrel), infliximab (Remicade), anakinra (Kineret), adalimumab (Humira), rituximab (Rituxan), abatacept (Orencia), golimumab (Simponi), certolizumab pegol (Cimzia), and tocilizumab (Actemra). These are TNF blockers. Each of these medications can increase the risk for infections, and the development of any infections should be reported to the health care professional when taking these newer second-line drugs for rheumatoid arthritis. Operation has an important place in treatment rheumatoid arthritis but each operation must be considered as a component in the overall plan of management and not as a substitute for other measures. Operation may be applicable to the early stages of the disease, or it may be used in the later stages of rheumatoid arthritis to salvage a joint that has been permanently damaged and remains a source of persistent pain. In early stages of rheumatoid arthritis, synovectomy is the commonly chosen surgery. Operation may also be required in the hand for repair or replacement of ruptured tendons, or for correction of finger deformity. Operations used in the later stages of joint disease are arthroplasty and arthrodesis. Arthroplasty is done at hip, knee, shoulder and elbow. Arthrodesis is done in small joints and in spine. In general, rheumatoid arthritis often improves during pregnancy. It is commonplace for the rheumatoid joint inflammation to decrease and be minimized during pregnancy. Unfortunately, this reduction of joint inflammation during pregnancy is not usually sustained after delivery. During pregnancy, only corticosteroid can be used, all other drugs should be stopped. Currently, there is no specific prevention of rheumatoid arthritis. Because cigarette smokings, exposure to silica mineral and chronic periodontal disease all increase the risk for rheumatoid arthritis, these conditions should be avoided to prevent rheumatoid arthritis. Hi, would you please recommend me good arthritis doctor’s name in bangladesh. I have no idea about that. Which Joint For? There is specialized in every joint separately. Brother bangla vhasai ektu bijaye likhben ki like What is RA?Etiology of RA?